This page is written by the game's inventor, Adam DeWitt. This game is a favorite of its inventor. Shosu Shogi (小数将棋 shōsū shōgi, "decimal shogi") is a game I invented during my early inventing spree back in 2016. It is very similar to standard Shogi, but is played on a 10x10 board. Among the novelties in Shosu Shogi are the Queens, which have the combined powers of the Rook and Bishop, and Gold Generals with the ability to promote. In addition to this, the Lance and Knight have more powerful promoted forms than they do in standard Shogi. Only the location of the pieces of one side are mentioned below, in normal (Chess-like) coordinates. The setup for the other side can be obtained by rotating the board 180 degrees. The King moves one square in any direction but not into check. The Black King is labeled 玉将 (gyokushō, meaning jeweled general in Japanese) and the White King is labeled 王将 (ōshō, meaning king general in Japanese). The Queen moves any number of free squares horizontally, vertically, or diagonally. This piece is labeled 奔王 (honnō, meaning free king in Japanese). The Dragon King (promoted Rook) moves any number of free squares horizontally or vertically, or one square diagonally. This piece is labeled 龍王 (ryūō, meaning dragon king in Japanese). The Rook moves any number of free squares horizontally or vertically. This piece is labeled 飛車 (hisha, meaning flying chariot in Japanese). The Dragon Horse (promoted Bishop) moves any number of free squares diagonally, or one square horizontally or vertically. This piece is labeled 龍馬 (ryūme, meaning dragon horse in Japanese). The Bishop moves any number of free squares diagonally. This piece is labeled 角行 (kakugyō, meaning angle mover in Japanese). The Great General (promoted Gold General) moves one square horizontally, diagonally, or vertically forward. This piece is labeled 大将 (taishō, meaning great general in Japanese). The Gold General moves one square horizontally, vertically, or diagonally forward. This piece is labeled 金将 (kinshō, meaning gold general in Japanese). The Vice General (promoted Silver General) moves one square horizontally, vertically, or diagonally forward. This piece is labeled 副将 (fukushō, meaning vice general in Japanese). The Silver General moves one square diagonally or vertically forward. This piece is labeled 銀将 (ginshō, meaning silver general in Japanese). The White Horse (promoted Knight) moves two squares horizontally and one square vertically, or two squares vertically and one square horizontally. The White Horse is not blocked by other pieces: it jumps to the new location. This piece is labeled 白馬 (hakuba, meaning white horse in Japanese). The Knight moves two squares forward and one square sideways. The Knight is not blocked by other pieces: it jumps to the new location. This piece is labeled 桂馬 (keima, meaning laureled horse in Japanese). The Vertical Mover (promoted Lance) moves any number of free squares vertically, or one square sideways. This piece is labeled 竪行 (shugyō, meaning vertical mover in Japanese). The Lance moves any number of free squares vertically forward. This piece is labeled 香車 (kyōsha, meaning incense chariot in Japanese). The Tokin (promoted Pawn) moves one square vertically, horizontally, or diagonally forward. This piece is labeled と金 (tokin, meaning reaches gold in Japanese). It may also be labeled と (an abbreviated version of tokin) or 个 (another abbreviated version of tokin). The Pawn moves one square vertically forward. This piece is labeled 歩兵 (fuhyō, meaning foot soldier in Japanese). When a piece moves to, from, or within the owner’s promotion zone, the owner may promote that piece. The promotion zone is the last three ranks of the board - the three ranks occupied by the opponent’s pieces at the start of the game. Promotion is optional – a player need not promote a piece immediately upon entering the promotion zone. However, a piece must promote if it would otherwise have no legal moves left on a subsequent turn. The promotions for each piece are as follows. A promoted piece that get captured reverts to its unpromoted state. Otherwise, a promotion is permanent. Promoted pieces cannot be demoted in any other way. Pieces can only promote once – promoted pieces cannot promote any further. The King and Queen do not promote. If a Lance, Knight, or Pawn reaches the last rank, it must promote because it would otherwise have no legal moves left on a subsequent turn. A Knight that reaches the penultimate rank must promote for the exact same reason. Captured pieces get retained in hand and can be brought back into play under the capturing player’s control. On any turn, instead of moving a piece on the board, a player may return a captured piece to any empty square on the board. This is called dropping the piece, or simply a drop. A drop counts as a complete move. The rules regarding drops are as follows. A piece may not be dropped onto an occupied space. Pieces that are dropped within the promotion zone do not promote immediately. A piece may not be dropped onto a space where it would have no legal moves left on a subsequent turn. Captures and promotions may occur normally on a subsequent move of the piece. Lances and Knights may not be dropped onto the last rank, as they would have no legal moves left. Knights may not be dropped onto the penultimate rank for the exact same reason. In addition to the rules mentioned above, there are special rules concerning pawn drops. Two Pawns (Japanese: 二歩 nifu): A Pawn cannot be dropped on a file that already contains an unpromoted Pawn belonging to the same player (promoted pawns do not count). Drop Pawn Mate (Japanese: 打ち歩詰め uchifudzume): A Pawn cannot be dropped to give immediate checkmate (although other pieces may be dropped to give immediate checkmate). A Pawn may, however, be dropped to give immediate check as long as it is not also checkmate. A Pawn may also be dropped to give immediate stalemate. This rule does not apply to Pawns that are already on the board. If the king is in check and cannot escape capture, it is in checkmate. Checkmate counts as a loss for the checkmated player. If a player's king is not in check but has no legal moves, it is in stalemate. The result of a stalemate is the same as that of checkmate – it is a loss for the stalemated player. 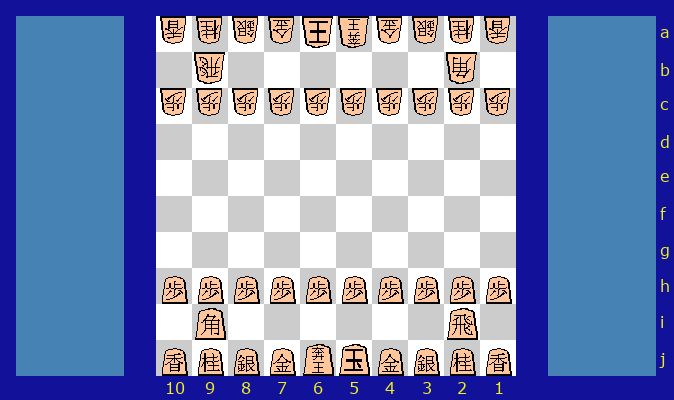 Repetition Draw 千日手 sennichite - If the same game position occurs four times with the same player to move and the same pieces in hand for each player, then the game ends in a draw, as long as the positions are not due to perpetual check (perpetual check is an illegal move). Impasse - If both kings have advanced into their respective promotion zones and neither player can hope to mate the other or to gain any further material, the players may agree to a draw. The Queen and White Horse may also be labelled 妃将 (okisaki, meaning queen general in Japanese) and 跳馬 (chōma, meaning jumping horse in Japanese), respectively. The White Horse's Japanese name, 白馬 (hakuba), translates to "white horse". This should not be confused with the White Horse from Chu Shogi, whose Japanese name, 白駒 (hakuku), actually translates to "white piece". You can Play Shosu Shogi online with Game Courier.